This study uses college student survey data and corresponding administrative data on campus recreation facility usage, academic performance, physical education class attendance, and co-curricular participation to examine nonresponse bias in college student surveys. Within the context of the Groves (Public Opin Q 70:646–675, 2006) Alternative Cause Model, we found compelling evidence of the presence of nonresponse error observed as student characteristics related to the survey topic that also explain their response propensity. An individual’s survey response propensity has a statistically significant relationship with their actual behavior for 2 of 3 survey topics. In 11 of the 13 survey questions used to measure the survey topic behaviors, we found statistically significant differences between the respondent and nonrespondent behavioral measures. 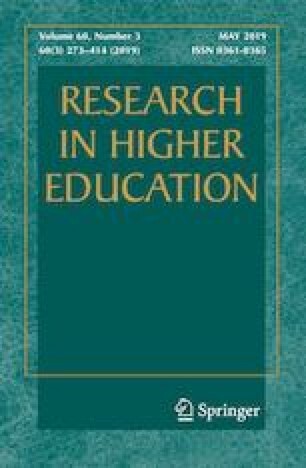 These findings hold important implications for survey researchers and those using student surveys for high-stakes accountability measures because survey summary statistics may not be generalizable to the target population. For each activity listed below, please identify if you have participated at any time while enrolled at NC State? Please include each event or competition separately; for example, count each game of an intramural basketball season. Outdoor Adventures, counting each instructional activity, day-long trek, or weekend excursion as one event—(A)I have never participated; (B)For one semester; (C)During multiple semesters; (D)In all semesters. My name is Trey Standish and I am a PhD student working under the supervision of Dr. Paul Umbach in the Department of Educational Leadership, Policy and Human Development at NC State University. I am contacting you to ask you to take a 7 minute survey about Gym usage and academics. Your name was selected as a part of a random sample of all undergraduate students at NC State. I am a fellow student and you completing the survey is instrumental to my earning a degree. Your answers to the survey questions are instrumental in understanding how your use of Carmichael Gymnasium and academics affects student outcomes. Participation in this study is voluntary. If you choose not to participate or to withdraw from the study at any time, there will be no penalty. The results of the research study may be published, but your name and responses will not be used. I would like to assure you that the study has been reviewed and received clearance through the NC State's Institutional Review Board. This is a friendly reminder to complete my brief survey about class skipping, gym usage and academics. I am a fellow student and you completing the survey is instrumental to me earning a degree. I very much appreciate your time and assure you it only involves completing a 7 minute survey about use of the Carmichael Gymnasium and academic history. National Survey of Student Engagement. (2016). NSSE response rate FAQ. Retrieved from http://nsse.indiana.edu/pdf/Resp_Rate_FAQ.pdf.